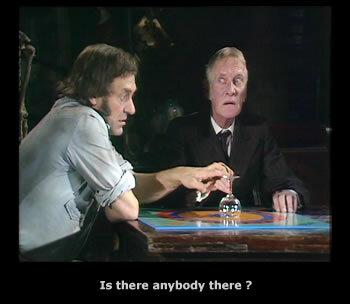 This turned out to be the last ‘regular’ episode of Steptoe. Like many of the later Steptoe’s Ray and Alan were more willing to bring in other actors. While the majority of the episode features Willy and Harry doing what they do best, a cast of other actors serve to broaden the piece, especially the excellent Patricia Routledge as Madame Fontana. The following evening a number of people arrive including the spiritualist and Dorothy Duddy, Albert’s new found love. Harold is persuaded to join the group, and so the lights are turned down and they all join hands around the table as Madame Fontana goes into a trance and calls for her spirit guide Geronimo. The first spirit to visit that evening is Dorothy’s former husband, followed by Emily Steptoe, Albert’s wife and Harold’s mother. 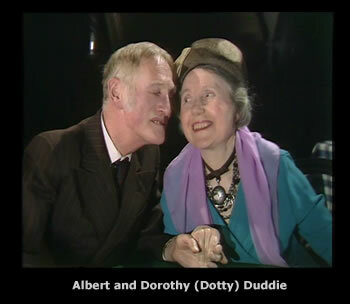 Both spirits approve strongly of Albert and Dorothy marrying, especially Emily who feels that “Harold needs a mother”. Harold is having none of it and takes drastic action to bring things to a halt. As always in Steptoe there is more to the situation than meets the eye and the relationship between Madame Fontana and Dorothy Duddy is exposed. Albert goes to bed a wiser but sad man. The final scene sees Harold contemplating the evening and thinking about how nice it would have been to talk to his mother. When I saw this episode over 30 years ago the end spooked me quite a bit, as I am writing this I find it still does. I wonder if I can sleep in my Dad’s bed tonight ? This episode stuck out from the rest. This time the whole thing begins because Albert, has fallen for a little old lady, who so happens to be a spiritualist. 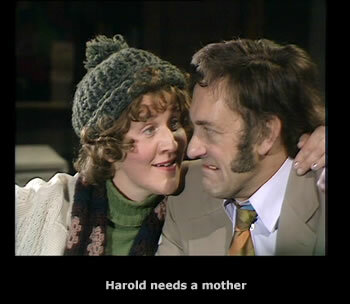 I like how the episode used Harold, to portray a non-believer, and his responses to his father's new found beliefs. To prove a point, he moves the glass on the board to spell out a famous, dead person, knowing it would spook father. At the Seance in question, the episode gets better, as all it seems to go, is encourage a marriage between Albert, and his new lady friend, as the Medium manages to get in touch with both dead Husband and Wife. Harold's reaction, is to go mad, believing the whole thing to be a big con, just as he did to begin with and he shruggs off the medium. However, before bed, the episode takes a disturbing, turn, and Harold gets spooked. The acting was just so typically good, as I love how the characters take turns with being gulliable, in one sense or another. Well, here it is. The worse episode of Steptoe and Son by miles. Sorry to the fans of the episode but I hate just about everything about it. The storyline is ridiculous, the character Madam Fontana is cringe inducing and that stupid voice over at the end that's supposedly Harold's mother has me squirming. It's a shame that this wonderful series had to have for it's final regular episode an absolute clunker like this. I can see why S&S was brought to an end, the fire had gone out. Thank goodness that the xmas special that followed it was back to some kind of form. Last year I decided to watch every episode in order and I was dreading reaching this, however I gritted my teeth and bravely faced it, I doubt that i will do so again. 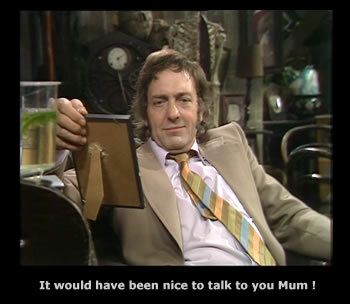 Steptoe and Son was so brilliant that I was used to almost perfection every week but I suppose that there had to be one story that failed to live up to the colossal heights that the rest of the show aspired to. Spooky goings on - Albert has been talking to the dead. That must have terrified them ! Don't miss the last ever regular episode of Steptoe and Son. Buy the DVD now.